Put Wide Set Eyes Together With Master Makeup Tricks! Wide set eyes are defined as those with more than the length of one eye between them. Beyond the studies, every woman wants to look as good as she can. So get the lowdown on how to play up your unique features. Here you will learn how to enhance your eyes, and minimize any flaws unique to your eyes. Especially if you feel that they're wider set than you'd like. This can be done by grooming your eyebrows, and applying eye shadow in a certain way. What Are Wide Set Eyes? Let’s start by assuming you have similarly sized eyes. If not, let's use the biggest eye as the base measurement just to be sure...Although that's not strictly scientific. If the space between your eyes is bigger than the length of one eye, you have wide set eyes. Mathematically, your eyes are deemed to be the most beautiful. This is because they are closer to displaying the famous ‘’golden ratio’’ proportion of 1.62. So if you have these you’ve been mathematically blessed! According to ancient Chinese face reading principles, wide set eyes are also said to indicate a person’s attention to detail. A person with a large space between the eyes is more interested in the bigger picture. They don’t pay too much attention to the details. So for example, if you boss has wide set eyes, they’ll respond better to your ideas if you approach them with the bigger picture than if you give them the details. Or maybe you’re a teenager trying to convince your wide set eyed mom to let you use eye shadow. You’ll get farther by showing her how it‘ll help boost your self confidence, and then career for life than by begging! On the flipside, you might feel that your eyes are too far apart. If you would like them to seem closer together, there are ways. The first thing to remember about using eye makeup is the color rules: Light colors make things look bigger and lighter. Dark colors make them look smaller and heavier. Here you want the space between the eyes to contract. The first stop will be your eyebrows. They frame your eyes, and their shape and length affect the profile of your face. The best eyebrow shape to make wide set eyes look closer together is a slightly angled shape. Also, a more rounded shape on the outside. This is because unlike a straight shape, the line will seem shorter and frame the eye inwards. If you have a naturally angled eyebrow shape, all you’ll do is trim and soften it. To reshape your brows, you can use an eyebrow stencil. 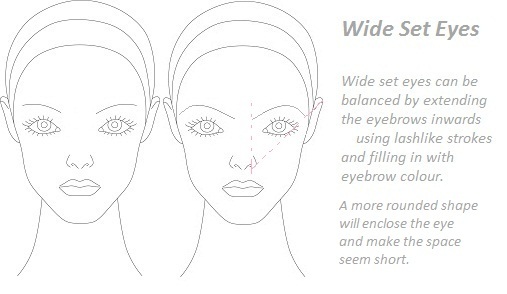 The other option is to use our classic eyebrow shaping guide which is not specific only to wide set eyes. Another useful piece of advice is not to let them extend too far on the outside of the face. Start by determining the appropriate length. Align the end of the brow in a straight line that goes from the side of your nose, and passes the edge of your eye. Tweeze the hairs beyond this line. This is shown in the picture below. The other length alteration is an extension inwards. If you have very full lashes you should skip this. It might (probably will) look too unnatural. Rather just don’t remove the hair that is already there. If you have sparse eyebrows though, it will be easier to extend your lashes inwards. There is an important dimension to keep in mind regardless of the fullness of your eyebrows. 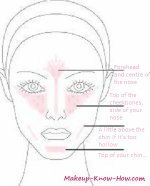 The inner ends of your brows are best aligned with the crease of your nostril as shown below. This can then be carefully done using eyebrow powder and pencil. Draw a line from the chosen inner point framing the brow above, and another below. You will then make lash-like strokes in between, or fill in with eyebrow powder. Then brush your eyebrows out to blend the pencil and eyebrow filler with the whole brow. Here’s the thing about eyebrow shapes to keep in mind. We are usually born with the best eyebrow shape for our face. Most of time, all you have to do is trim and shape it. This just cleans them up and defines them so that they can look even more attractive. Line the lash line with black liner all around for definition. The basic color pattern will be darker colors on the inside of the eye, and lighter colors on the outside. So choose your color palate, which can be two or three colors. Sweep a neutral shade that is close to your skin color over the eyelid and stop where your brow bone begins. If you want a more dramatic/ fun look, you can also line under the eye with this color. Draw this line from the outside of the eye, to halfway across the eye. Then take the medium color and apply on your eyelid. The darkest shade will then go on the inside of the eye. Spread it out towards the brow bone (only on the inside of the eye), and just above the lash line. For more intensity, line the other half of the bottom lid from the inner corner of the eye. Below you will find an example of the application using a blue color palate. Finish the look off with generous lashings of mascara. Black mascara that also lengthens the lashes over the upper lid will darken and elongate your lashes. Some of the most beautiful faces have wide set eyes, and look good in many other makeup application types. So it’s important to embrace your features and keep the shape of your entire face in mind when applying makeup.